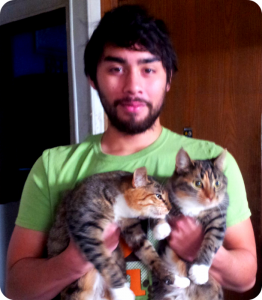 Meet Oak Park Pet Sitter, David! David has been walking dogs around the central area of Oak Park for nearly nine months now! My favorite game: Duck, duck, goose! Best gift ever: Any gift given from the heart. My superpower would be: Invisibility! Life philosophy: Don’t worry, be happy! This entry was posted in Oak Park Pupdate and tagged cats, Dog Walker, dog walking, Oak Park, Pet Sitter on January 7, 2014 by Laura Rumage.